Are you looking Bank Jobs??? Do you want to make the career in the banking sector? If yes, then here is a good opportunity for you. Saraswat Bank Recruitment 2018 for filling up 300 Junior Officer Vacancies for Marketing and Operations in Grade B. Candidates who are interested and eligible also can fill Saraswat Bank Online Form either here or official site. The online registration is starting from 23.05.2018. Applicants can fill Saraswat Bank Junior Officer Vacancy application form till last date 04.06.2018. Furthermore, details you must read our full article properly. 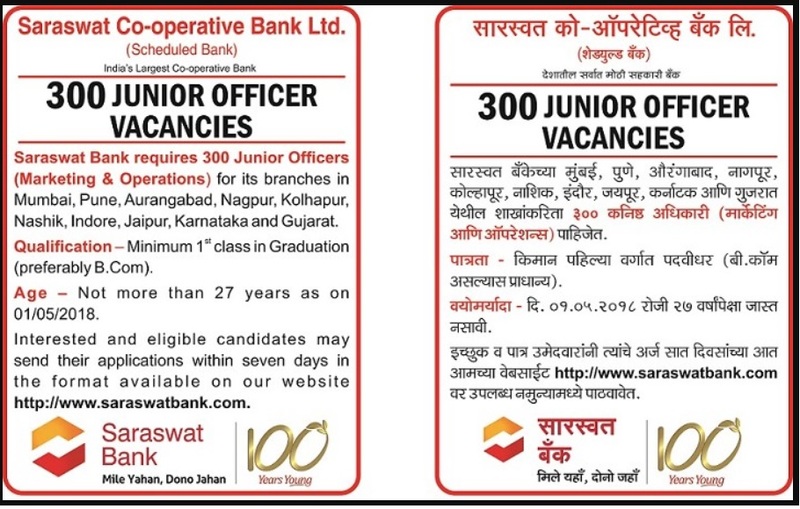 Saraswat Co-Operative Bank Ltd. is inviting online application form for filling up 300 Clerical Cadre Vacancies. This is a good opportunity for candidates who want to make a career in banking line. The Saraswat Bank Vacancy is raised for Marketing and Operations Field. Thus, applicants, those are completed their Graduation may apply for Saraswat Bank Jobs. More information like eligibility criteria, application fees, selection procedure and how to apply are mention on below section. Important Dates for Saraswat Bank JO Vacancy – What is the Last Date of Saraswat Bank Recruitment 2018 ? How much Monthly Salary Will Be Paid for Saraswat Bank Junior Officer Vacancy ? Name of Bank : Saraswat Co-Operative Bank Ltd. The bank has distributed vacancies as location wise. Applicants who are interested for Saraswat Bank Recruitment can check their suitable center and location. Participants who want to apply for Junior Officer jobs must ensure that they are eligible or not. Saraswat Bank Recruitment 2018 eligibility criteria contain details of education qualification, age limit, and other information. For more details check below section. Candidates must be passed Graduation in First Class (Preferably Commerce) from a recognized university. Applicants who are appearing in final year examination are also eligible for Saraswat Bank Jobs 2018. As on 01.05.2018, the minimum age requires for all applicants should be 21 years. Aspirants who are going to apply for Saraswat Bank Recruitment 2018 must not be more than 27 years. Upper age relaxation details refer to official advertisement. Participants selection will be made according to their performance in written examination. To attend the interview process applicants must get minimum 50% marks. Shortlisted candidates for interview list is mention on site at the time of result declaration. Saraswat Bank Jobs Online examination is organized in English language only. For more details check Saraswat Bank Exam Syllabus 2018. Candidates who want to fill Saraswat Bank Online Form must require paying an application fees. Candidates need to pay Rs. 600/- toward application fees +GST charges. No other payment method will accepted for Saraswat Bank Recruitment 2018. You must require to generate e-receipt to complete recruitment procedure. Furthermore, information check official notification, which is mention below. If you are selected for Saraswat Bank Jobs you will receive an attractive salary. Probation period applicants will receive Rs. 19555/- approx. After confirmation, they will get Rs. 21100 approx. The annual income will be Rs. 3.20 lac approx. as per salary of April 2018. If you want to apply for Saraswat Bank Jobs that you need to fill the online application form. Candidates can apply online either here or official website. 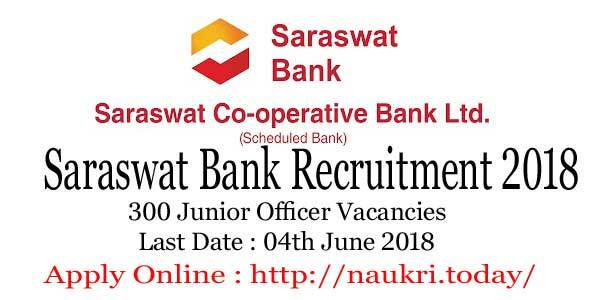 Here our team provides online link to apply for Saraswat Bank Junior Officer Recruitment 2018. Before going to fill online application form you must have valid email id and mobile no. Applicants also keep scanned copy of photograph and signature. Instructions to filling up Saraswat Bank Online form is mention below. Firstly, all applicants log on to official site saraswatbank.com. Go to career section and then find Junior Officer (Marketing & Operations) Advertisement. Read the Saraswat Bank Notification Carefully. First you require completing registration procedure. Enter your personal details like name, email id, mobile no. address etc. Then submit your registration for Saraswat Bank Recruitment. After that, for Saraswat Bank Junior Officer Job you get a unique registration no. and password. Login with given no. and password and then enter your educational information. Payment of application fees of Saraswat bank Vacancy through online mode. Submit your application form and then take hard copy of it. Conclusion: Saraswat Bank Job 2018 for employment of 300 Junior Officer Vacancy. Interested and eligible candidates may fill the online form either official site or here. The Saraswat Bank Recruitment online form is available from 23.05.2018 to 04.06.2018. Full details are mention on above segment.